Summer is here! With it comes its usual promise of soaring temperatures that will have one cranking up the a/c. I won’t be complaining though. Our summer also brings sunshine, blue skies, and a thousand excuses to pack your bags and head out on a seaside jaunt – where the promise of white sand and crystal water beckons. And the beaches aren’t the only draw of summer on our islands. There are the mountains too for those who wish to escape a bit of the heat. And anywhere in between. The arrival of summer just sets everyone’s (no matter the age) thoughts to vacation, no matter what the destination. We will be leaving a today for our first summer trip of the season. Nowhere far or fancy, just a drive out of the city to a friend’s place near the sea. This is one of little C‘s first trips and I am quite excited. Although traveling with a child is a whole different ballgame (gone are the days when all I needed was a backpack! ), it carries a whole new set of pleasures and surprises. Not the least being the feeling that you are experiencing even the little things for the first time through the eyes of a child. I bookmarked this recipe from the awesome Smitten Kitchen as soon as I saw it. I am always on the look out for homemade (and healthier) versions of snacks for the little one. This fit the bill to a T…and it makes a great travel snack as well — easy to pack and cart around and great to have on the go! – Process all the ingredients in a food processor for about 2 minutes until the dough forms into a ball or until you can form the pieces into a ball (mine never really formed into a ball until I “assisted” it with my hands). – Divide the dough into two discs, wrap in plastic wrap, and chill for 30-45 minutes — a must in our summer heat! – Take one of the dough discs out and roll to a thickness of 1/8 inch (I like to roll the dough out between two pieces of parchment). Cut the crackers out with your cookie cutter (you can dip the cookie cutter in some flour to ensure a clean cut) and transfer gently to a parchment lined cookie sheet with 1/2 inch of space in between them. – Bake in a pre-heated 350F oven for about 12-15 minutes. Remove and cool the crackers on a wire rack. Repeat with the second dough disc. Sadly, I do not have, now could I find locally (yet! ), the adorably tiny fish cookie cutter Deb has. Instead I used the smallest of my round cutters and this work fine for now (I will definitely be on the hunt for cuter cutters soon!). I also used a mix of cheddar and mimolette cheese as I couldn’t find orange cheddar and the mimolette’s bright orange color, and delicious taste and texture (it was a relatively young one), seemed perfectly acceptable to me as a replacement. The crackers are lovely — cheesy and crisp. Despite most of the flour being whole wheat, the crackers do not have a very overtly wheaty taste, just a slight earthiness that I think is perfect with the cheese. They got the thumbs up from both little and big C‘s, the former munching on two in a row and the latter declaring that it would go well with a glass of wine (I agree!). Those crackers look very tempting! I bet they taste cheesilicious. This would definitely go to my to-do-list 🙂 love the combination of cheese and whole wheat pastry four. Yum yum yum! My nieces make something similar from their Angelina Ballerina cookbook, and I love them! If Little A could eat wheat and dairy, he would too. The Healthy Options version of goldfish crackers (shaped like bunnies) were his fave snack before we went GFCF. YUM! What a perfect snack! Thanks for sharing! Yum! I love Goldfish and I'm sure this is even better! I gotta try this. How crisp and delicate these cookies look! Lovely texture and click. Nice to come to this beautiful space from Twitter. Hi Anne! I like the combination too 🙂 Looking forward to incorporating my whole wheat pastry flour into more goodies! Hi Paul! Let me know how it works with the quezo de bola! crackers– one of those snacks that i didn't think one could make at home! i like goldfish crackers. and the seaweed flavored animal crackers. how cute. maybe when little C is older she can help stamp out her crackers. i always loved forming cookies (and eating the dough) whenever my mom had time to make some. i will give this a try, maybe with a sharper cheese and some chili. enjoy your beach trip! always good to be out o the city once in a while! the crackers look lovely! And enjoy your trip with little C.! I have never eaten such crackers. Great recipe. I couldn't find the little cookie cutter either! If you locate it, let me know. I'd love to make them that way! Have a nice and safe trip! Hi Nayna! 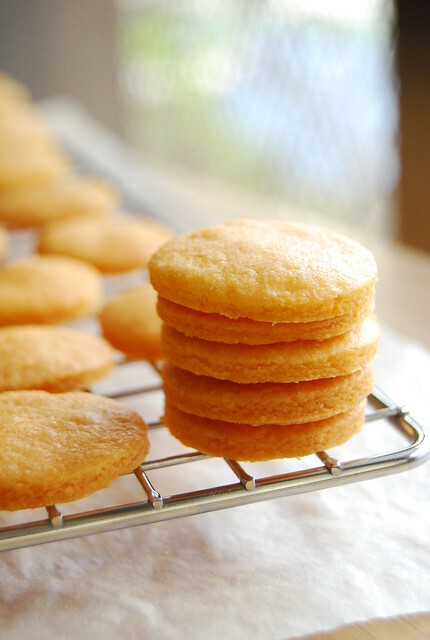 Yes you can make crackers at home…my next project is graham crackers! I am definitely hoping to turn little C into my “assistant” in the kitchen. Good learning for her, bonding for us, and fun too 🙂 The beach was great…she loved it! Hi Anh! Thank you 🙂 We had a blast! Hi Midge! I imagine it would indeed be that 🙂 Very versatile! Bookmarking this one, I love goldfish crackers too! Saizen is Robinson's 88 (well, 85 for them, I think) peso Japanese chain. They have branches in Galleria and Trinoma. I think there are more but these are the only two I'm definitely sure of. Warning though, these are black holes! Your wallet may end up crying. If you're traveling, the same chain is known as Daiso in other Asian countries, dito lang hindi because someone else beat them to the name. Thanks Kaoko! Will check them out when I am in the area…I am taking your warning to heart! I can get sucked into those stores and emerge in debt! Have you tried doing this without using a food processor? We don't have one at home—though I do have a stand mixer. Btw, yes, there are fish-shaped cutters at Daiso/Saizen. I found a pack in my cooking bin and it had the Daiso label. I'm just not sure if I bought it locally—but then, the local Saizen rotates inventories. And I remember seeing the local branch carry the same line of cookie cutters.